Fruit flies are tiny flies (2-4mm) that are associated with fermenting fruit, vegetable matter or sweet liquids. Leave a glass of wine out and the little fly that you find 'happily' swimming around on the surface is likely to be a fruit fly. Some species are dark and some pale often with red eyes and often accompanied by hundreds of his or her associates. 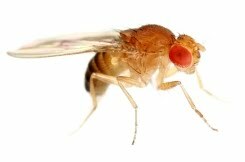 The recent wet weather along with still mild temperatures and high humidity in Auckland and other parts of New Zealand have seen a boom of fruit fly numbers. The wet weather has meant that rotting fruit or vegetable matter such as in bins, compost heaps or just left lying around are fermenting rather than composting properly. The fermentation process produces vinegar which attracts the flies to the rotting material and here they feed and breed. If you have bins attracting fruit flies, clean the bins thoroughly and when dry treat the interior and exterior with NO Bugs Super or NO Flies sprays. If your compost is attracting fruit flies it suggests that the compost is too wet. Aerate the compost and protect the top of the compost with a tarpaulin or similar and let the compost dry out a bit. The compost can be treated with insecticide but remember not to use the compost on crops for some weeks after treatment. Check the withholding period on the insecticide product. Kiwicare is committed to finding organic solutions for controlling pests and diseases in the home and garden. We also believe that where possible our organic products gain the highly respected BioGro certification to demonstrate that they comply with requirements of organic producers. Many products can claim to be organic without review and certification by an independent organisation such as BioGro. To be sure you are purchasing products that have been reviewed and certified as suitable for organic production look out for the BioGro logo. Kiwicare BioGro Certified products are listed on the Kiwicare website. We are happy to say that NO Fungus Copper Oxychloride has gained BioGro certification for control of diseases on fruits, vegetables and ornamental plants. NO Fungus Copper Oxychloride is a broad spectrum fungicide and bactericide controlling a wide range of fungal and bacterial diseases on fruits, vegetables, and ornamentals. 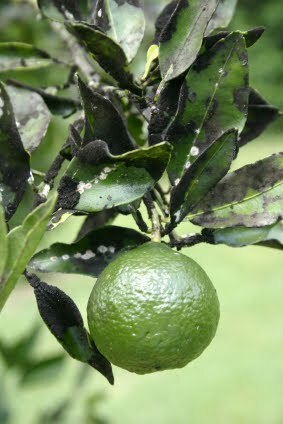 Diseases controlled include blackspot, downy (or downey) mildew, leaf spot, halo blight, anthracnose (cankers), verrucosis, brown rot, leaf curl and many more. Can be used safely on fruit and vegetables with no withholding period. A fungus walks into a Glasgow bar. The barman says "Sorry, you'll have to leave." The barman replies "Because there's no mushroom." The recent deluge in many parts of the country and the cold snap on its way is driving mice (and rats) into our homes and buildings seeking shelter. Food sources in the wild are also dwindling and if they find food in or around buildings they will not only survive, they will continue breeding. 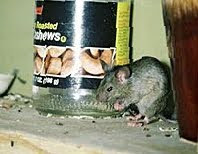 It is an important part of preventing infestations of rats or mice that potential food sources are removed. So in your house, put away food in sealed containers. Don't leave food or food scraps over night. Vacuum up spilled crumbs of food. Make sure your rubbish bins are tightly shutting. Outside, make sure animal feed is kept in sealed containers. When feeding animals don't put more out than the animals will eat. If possible place feeders where rats or mice will not easily reach the food. There may be natural sources of food outside that you can reduce. Rats in particular like to collect nuts such as walnuts and store them. Collect the nuts yourself and sweep up those that fall. One source of food, for mice in particular, that you may not think of is cluster flies. 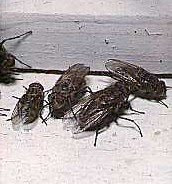 Mice love to eat cluster flies and ‘good’ sized clusters will provide fresh food for mice through the winter. Deal with the cluster flies and sweep up the flies. What has no wings but will fly? I think we can say winter has arrived. The wet weather across the country today and forecast for the next few days is likely to induce rats and mice to move indoors seeking shelter and food. The long mild autumn has allowed rodent numbers to remain high and take advantage of the fruit, grain and nuts available. As these food sources dwindle and the wet and cool weather takes hold, rodents must find warmth, shelter and a new food source to survive. All too often they find their way into our homes, offices, farms and factories. Here they find shelter and access to food that we have spilt or not sealed out of their reach. Take 10 minutes to look around your kitchen and check that should a mouse or rat get in that there is no food behind the fridge, or spilled down the side of the cooker. Check that dried good such as cereals are in sealed, preferably metal, containers. Make sure butter and even bars of soap are out of the reach of rodents. Remember, rats and mice are excellent climbers and just putting food high on a shelf may not be out of their reach. Put bait in safe places NOW. Don't wait for signs of their entry. Place the bait where rodents might encounter it but where pets and children cannot. Set traps as well. Baits such as NO Rats & Mice blocks or bait and tracking powder are more effective than traps but once a rodent has taken some bait it is more likely to get caught in a trap and body can then be removed. When the rain stops go outside and examine your buildings for possible entry points. I have discussed proofing in a previous blog posting. You might also consider placing some rodenticide around the exterior of the house to reduce the numbers that might fins their way in. What is a mouse's favourite game? I am often asked by worried enquirers "where will the rats and mice killed with poisons go to die?" The worry is they "don't want a bad smell from dead rodents in the house". Almost all rodenticides are anti-coagulants. An often perpetuated 'old wives tale' is that anti-coagulant poisons like NO Rats and Mice make the rats and mice thirsty and they go outside in search of water and die there. There is a little truth in this, there is a slightly increased likelihood of the rodents dying outside, but in the vast majority of cases they will go to their nest and die there. Often the nest is inside. However, even if the rats or mice die inside there is little likelihood of a bad smell. Bad smells are only a problem if the rodent dies somewhere very warm and un-ventilated. In 99% of cases there is not a problem. In order to prevent bad smells it is more important to deal with the infestation as the pests will be dying of natural causes and there is a higher chance of a bad smell. Rodenticide baits are the most efficient and effective way to deal with rat and mouse infestations. I suggest to worried enquirers that they use traps in conjunction with rodenticides. When a rat or mouse has taken some poison it is more likely to be caught in a trap and then the body can be removed and the risk of bad odours reduced. Once the infestation is eradicated then I suggest paying attention to proofing the house to prevent further infestation. You can get more information on how to prevent rats and mice getting in on the Kiwicare website. A drunk walks into a bar with a rat and a frog. The drunk asks the barman if he can have a free drink if he shows him something amazing. "OK" says the barman, "But it must be truly amazing." The drunk puts the frog on the bar piano and the frog begins to play the most amazing jazz. "Wow!" says the barman. "That WAS truly amazing. Have a drink on me." On finishing his drink the drunk asks "Can I have another drink if I show you something even more amazing?" "OK." Says the barman. "If it is better than before, you can drink all night." The drunk then sets the rat on the bar. The frog starts playing the piano and the rat sings along." "Drinks all night for you." says the barman impressed. An agent who has watched all this comes up to the drunk and says "I pay $1,000,000 for the frog and the rat." "No deal" says the drunk. "OK. What about $1,000 for the singing rat?" "Are you mad?" says the barman to the drunk when the deal is done and the agent has left. "Relax" says the drunk. "The frog is a ventriloquist." Once again cluster flies have hit the headlines. This time a box full of live cluster flies was sent to the Agriculture Minister David Carter. The box was marked with a note saying the box contained a bomb. This caused the New Zealand Parliament building, known as The Bee Hive, to be evacuated. It would seem that this was the action of a disgruntled person making a protest about the increase in cluster flies that has been attributed to increased dairy farming; the fly larvae feed on earthworms in pasture and as pasture land increases so do the number of cluster lies. It has been reported that some homes have been invaded by as many as 10,000 flies clustering to survive over winter. These flies are frequently described as 'disgusting' by those whose homes they invade (see the comment on a previous blog). What is the difference between a fly and a bird? A bird can fly but a fly can't bird! I am a member of the New Zealand Biosecurity Institute which is and organisation made up of people interested in preserving and protecting the natural environment of New Zealand. We organise activities on a local and national basis and produce the quarterly Protect magazine. Create opportunities for professional development of members. NETS is the annual National Education and Training Seminar held by the NZBI. Each NETS is attended by people from all facets of the Biosecurity field and features workshops and presentations on many different aspects of invasive species management. The next NETS conference will be held in Blenheim 21st-23rd July 2010. The conference has the title "Know How, Can Do, Job Done!" and is open to anyone with an interest in the field. You can join the NZBI for as little as $30 and receive discounted attendance at NETS, free quarterly Protect magazine and access to the regular meetings and field trips organised by your local branch. Registrations are now open for NETS2010 and you can view and download the Registration Brochure here. One day a man was driving down the road in a hot red convertible. He was driving 15 mph when a rabbit that hopped in front of his car. As the man swerved the rabbit swerved also and was run over. The man got out of the car and started crying "OH-MY-GOD... OH-MY-GOD!!!!" Just then a blonde drives up and asks him what's wrong, when he tells her she says, "Oh I can fix that." She goes to her car, pulls out a can and sprays the rabbit with it. It instantly comes alive and hops off, but every five feet it turns back to wave, before finally disappearing into the forest. The guy is amazed and says, "How did you do that?" The blonde just tosses him the can and drives off. The can says "Hair Spray: Guaranteed to bring your hair back to life and create a permanent wave." Greasy Cutworm are the caterpillars of a moth Agrotis ipsilon. 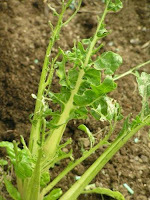 These caterpillars do damage to all sorts of plants found in your vegetable patch. Tomatoes, corn, beans, brassicas, and many other crops can be damaged. The caterpillar stage is usually found between December and April but there have been reports that they are still around now (May). Caterpillars are brown to grey when young and older larger larvae are dark grey with two yellow longitudinal stripes on top and light grey underneath. The caterpillars can be controlled on vegetables and other plants using Kiwicare NO Caterpillars which is Bacillus thuringiensis kurtsaki (Btk). The Btk is a completely safe naturally occurring soil bacterium that when ingested by caterpillars produces a toxin lethal to the caterpillars in their alkaline stomach. With NO Caterpillars there is no withholding period and so your vegetables can be protected without compromising the harvesting. A toddler was found chewing on a slug. After the initial surge of disgust the mother said, "Well, what does it taste like?" "Worms," was the reply. I regularly come across reports of bad reactions, infections, abscesses, and ulceration that are claimed to be caused by white tail spiders. A recent report can be found here. There have been studies carried out investigating hospitalizations of people with such reactions and infections. 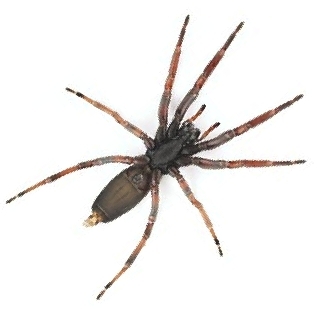 The studies found no link to confirmed white tail spider bites. Few people are able to positively identify the cause of the 'bite' as a white tail. Have you a story about being bitten by white tails? Whether you had a bad experience or had no reaction I would be interested to hear from you. What does a polite white tail spider say?